If you live near Brooklyn and you're into refashioned fashion--and really, who isn't?--you gotta check out tonight's trunk show of "art and apparel from recycled materials" at Etsy Labs, the bricks-and-mortar (does anyone say that anymore?) HQ for the cool crafters selling on Etsy.com. I just read about their "Trashion" show on Treehugger and would be there in a hot minute if I didn't live 2,000 miles away. What, exactly, is Trashion, you ask? Take this library-card paper-flower necklace (pictured). 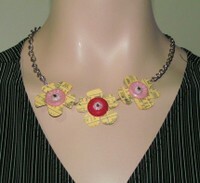 "This triple flower choker necklace is made from discarded library due date cards," says its creator, Miggi. "They are laminated and cut into flower shapes, and then vintage buttons and sequins are sewn in the center. The chain comes from a broken vintage chain belt. Everything about this necklace is upcycled and reused EXCEPT the toggle clasp, which is new." Call it low-impact design that makes a big impression.